Residents and their family members may voice grievances to the facility or other agency/entity that hears grievances without discrimination or reprisal and without fear of discrimination or reprisal. The facility will make prompt efforts to resolve grievances. (Lynda Goldthwaite RN BSN,NHA) has been designated as the Grievance Official and can be reached at ( 20 Chester Road Derry, New Hampshire 03038 phone number (603) 432-3801 email address lgoldthwaite@aurorahealthmgt.com). The Grievance Official is responsible for overseeing the grievance process; receiving and tracking grievances through to their conclusion; leading any necessary investigations by the facility; maintaining the confidentiality of all information associated with grievances; issuing written grievance decisions to the resident; and coordinating with state and federal agencies as necessary in light of specific allegations. Notices of resident’s rights regarding grievances will be posted in prominent locations throughout the facility. 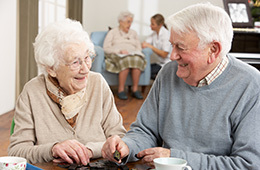 A resident or family member may voice grievances with respect to care and treatment which has been furnished as well as that which has not been furnished, the behavior of staff and other residents, and other concerns regarding their LTC facility stay. The facility will not prohibit or in any way discourage a resident from communicating with external entities including federal and state surveyors or other federal or state health department employees. A copy of the grievance procedure, including the address and phone number of the department to which complaints may also be made will be posted on facility website. Upon request, the facility will give a copy of this grievance policy to the resident. The contact information of the grievance official with whom a grievance can be filed, including his or her name, business address (mailing and email) and business phone number. The contact information of independent entities with whom grievances may be filed, that is, the pertinent State agency, Quality Improvement Organization, State Survey Agency and State Long-Term Care Ombudsman program or protection and advocacy system. The time frame that a resident may reasonably expect completion of the review of the grievance and a written decision regarding his or her grievance. Verbal complaint to a staff member or Grievance Official. Written complaint to a staff member or Grievance Official. Written complaint to an outside party. Verbal complaint during resident or family council meetings. Via the company toll free Customer Service Line (888) 403-8877. A grievance may be filed anonymously. This facility will not retaliate or discriminate against anyone who files a grievance or participates in the investigation of a grievance. The staff member receiving the grievance will record the nature and specifics of the grievance on the designated grievance form, or assist the resident or family member to complete the form. Take any immediate actions needed to prevent further potential violations of any resident right. Report any allegations involving neglect, abuse, injuries of unknown source, and/or misappropriation of resident property immediately to the administrator, and follow procedures for those allegations. Forward the grievance form to the Grievance Official as soon as practicable. The Grievance Official will take steps to resolve the grievance, and record information about the grievance, and those actions, on the grievance form. Steps to resolve the grievance may involve forwarding the grievance to the appropriate department manager for follow up. All staff involved in the grievance investigation or resolution should make prompt efforts to resolve the grievance and return the grievance form to the Grievance Official. “Prompt efforts” include acknowledgment of complaint/grievances and actively working toward resolution of that complaint/grievance. All staff involved in the grievance investigation or resolution will take steps to preserve the confidentiality of files and records relating to grievances, and will share them only with those who have a need to know. The Grievance Official, or designee, will keep the resident appropriately apprised of progress towards resolution of the grievances. Grievance will be completed ASAP but no later than 30 days from receipt. The facility will take appropriate action in accordance with State law if an alleged violation of resident’s rights is confirmed by the facility or an outside entity, such as State Survey Agency, Quality Improvement Organization, or local law enforcement agency. The date the grievance was received. The steps taken to investigate the grievance. A summary of the pertinent findings or conclusions regarding the resident’s concern(s). A statement as to whether the grievance was confirmed or not confirmed. Any corrective action taken or to be taken by the facility as a result of the grievance. The date the written decision was issued. For investigations regarding allegations of neglect, abuse, injuries of unknown source, and/or misappropriation of resident property, a report of the investigative results will be submitted to the State Survey Agency, and other officials in accordance with State law, within five working days of the incident. Facility will follow abuse reporting and investigation policy for these allegations.